Using a free-standing mixer fitted with a dough hook attachment (if available), pour in the dry mix ingredients. Mix the liquid ingredients in a measuring jug. Then slowly pour the liquid into the mixer while kneading on a low speed for around 2 minutes, until all the water is mixed into the flour. Once combined, turn the speed up to high for a further 2 minutes, until the dough has a smooth yet tacky feel to it. Once the dough has been well kneaded, dust it with 2 tablespoons of flour, scraping off any additional dough on the sides of the bowl. Shape the dough into a rough ball, then coat it lightly with 1 tablespoon of vegetable oil, cover the bowl with a damp cloth and leave aside in a warm, preferably moist, draught-free location (such as inside a room-temperature oven) for 1 – 1½ hours. Once the dough has doubled in size, you can make it into whatever shape you wish before steaming. Steaming time will vary between 8 and 15 minutes, depending on the shape and size of your finished buns (the thinner the bun, the shorter the steaming time). 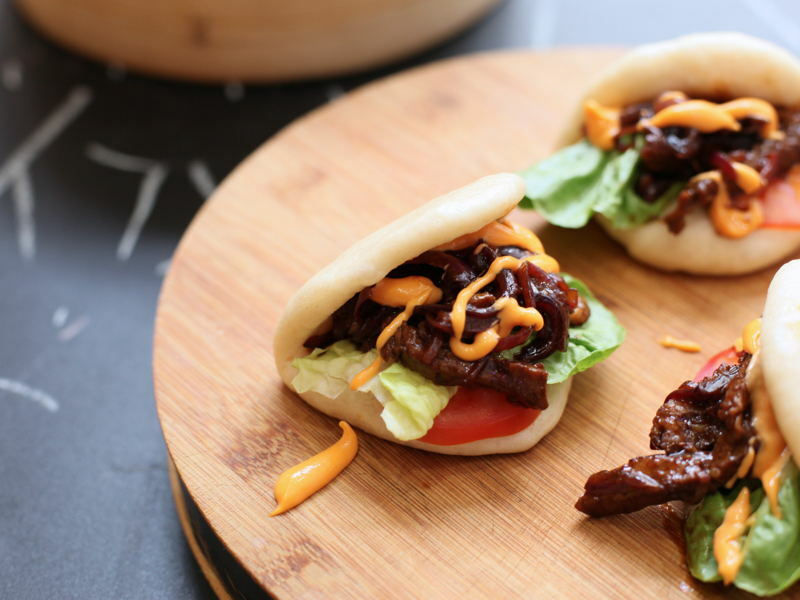 The same cooking method is used for all of the bao shapes. Place bao on squares of greaseproof paper or dim sum steam papers and then steam for 8 minutes on a full steam in a covered steam basket, either inside a wok half-filled with boiling water or if you are lucky enough to have a steam oven with a 100% steam function, without opening the lid or door, until cooked through and risen well. Rub ‘the marinade’ into the pork shoulder until it’s completely coated. Then place into a sous vide bag and vacuum pack well. Ideally leave in the fridge overnight, or for a minimum of 1 hour, to marinade. Place in the sous-vide oven at 63 degrees C for a minimum of 3 hours for a sliceable, yet tender finish. Then slice the sous-vide pork shoulder into thin (2-3mm slices) ready for it’s stir fry finish. Have the steamed buns fully steamed and ready for the fried meat once cooked. Slice the tomato into thin circular slices and make sure your lettuce is washed and patted dry so it maintains its crunch. Heat 1 teaspoon vegetable oil in the wok to a high heat. Add your onions and fry for 30 seconds – 1 minute, then push aside and add 1 additional tablespoon of vegetable oil to the wok. Maintain a high heat and bring the oil to smoking point. Once smoking hot, add the each piece of meat to the wok and sear well by pushing into the meat with the spatula / ladle. Bring the onions over the top of the seared meat, and then fold through the wok once and pour ‘The sauce’ into the wok and bring to a vigorous boil. Then turn the hob off and serve in the homemade Hong Kong Steamed Buns. Once the chops are fried, place them directly into the steamed bun, followed by a couple of slices of tomato and the lettuce. Squeeze a dollop of sriracha mayonnaise over the top and serve.